When T and I travel, we try to plan a few fun things for each trip but leave much of our experience to serendipity. Since I’m a planner, I generally try to find a few interesting neighborhoods and focus our wanderings there. While we were doing our touring in Chile, I found out that not only was there a museum of fashion (Museo de la Moda) in Santiago, but that they were featuring an exhibition I had been dying to see. I am a huge fan of the show and had been lamenting that I had missed the chance to see the huge Mad Men exhibition in NYC at the Museum of the Moving Image–so this was the perfect option to see some of the fashions I had loved on the show. Janie Bryant, the show’s costumer, is one of the most talented people I can think of. If you’d like to go down a really long, but really interesting rabbit hole, check out Tom & Lorenzo’s episode-by-episode costuming recaps of the series. Almost every article of clothing is chosen for a reason–not just because it’s vintage and looks pretty, but because it tells part of the story of the person wearing it. 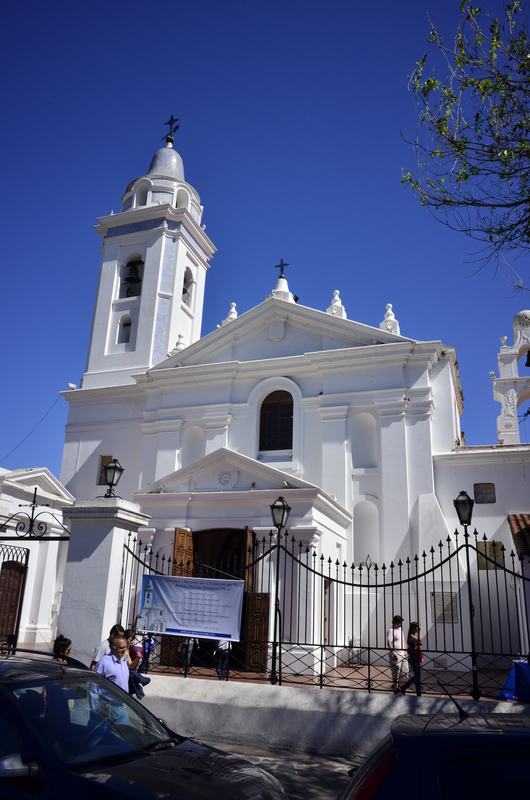 Needless to say, we made sure we hopped a cab to the Vitacura neighborhood in Santiago. Set back from the road, behind an almost blink-and-you’ll-miss-it fence, is a beautiful house inspired by Frank Lloyd Wright’s designs housing a gorgeous collection of textiles. 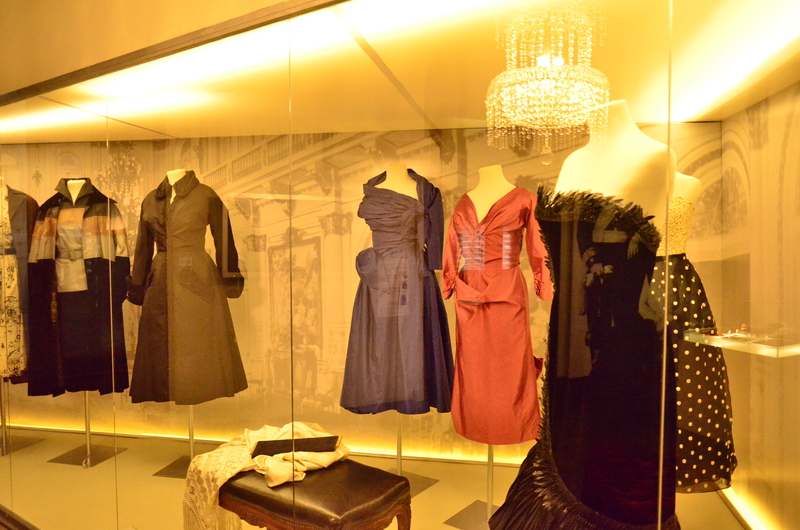 El Museo de la Moda is the former home of Chilean textile impresario Jorge Yarur Banna. His entire family seemed to be textile collectors, and thus the museum has a wide-ranging and interesting collection. They have a very extensive soccer textile collection, as well as some other famous garments–including garments worn by Marilyn Monroe, John Lennon, Elizabeth Taylor, Joan Collins, Amy Winehouse, and others. Elizabeth Taylor (black), Marilyn Monroe (zebra), with a reflection of one of my favorite pieces of political propaganda/swag–a Nixon dress. The Smithsonian has an “I Like Ike!” one I find equally charming. In addition, the ladies of the Banna family of the 1960s seemed to have a penchant for buying American fashion magazines (namely, Vogue) and ordering the entire outfit seen on the cover. It was fascinating seeing an entire fashion cover outfit up close and personal. I was quite impressed with the vintage makeup and personal care items the museum displays. 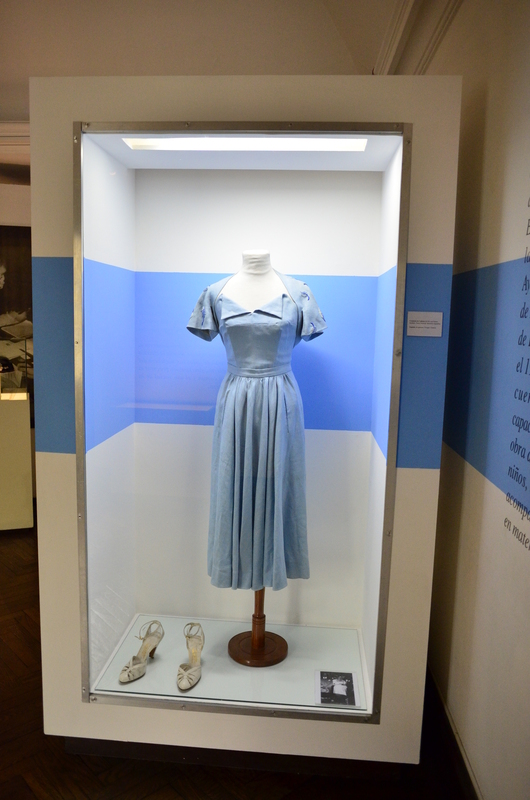 It’s not often that a museum has vintage lipsticks, shavers, and other “daily use” items, since it’s so common for them to be used and tossed afterwards–but Museo de la Moda had a full case of both men’s and women’s products–down to lip blotting papers. 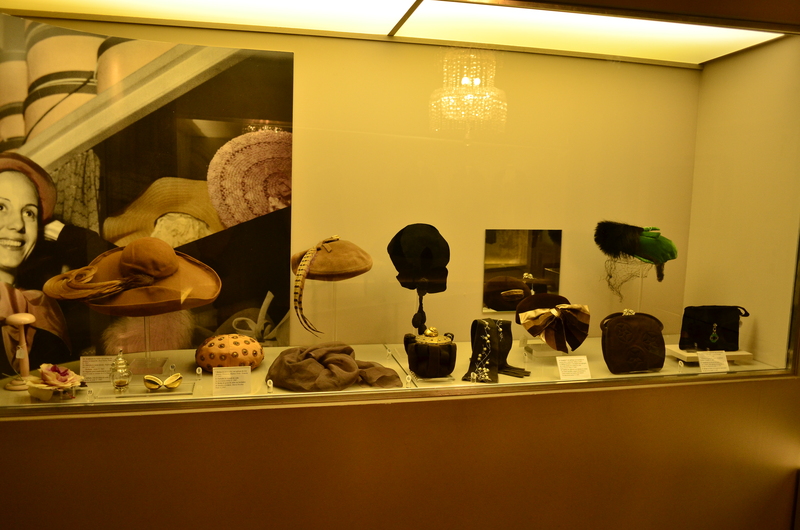 The cases allowed for up close investigation of each item, which was really nice. The obvious spotlight of the experience, though, was the Mad Men exhibition that extended throughout most of the museum. Since the show used so many different costumes during production, this was clearly not the one and only set of Mad Men costumes on display in the world–but there were still some fairly great examples from the show. Accompanying most of the displays were plaques with basic information, as well as a retro-style television screen showing the scenes in which the clothes featured to illustrate how the clothes actually moved. The Museo de la Moda couldn’t have been a better place for the exhibition–with the FLW mid-century aesthetic already in play, the clothes felt right at home, whether in the museum’s library or in the old, enclosed carport next to a shiny Cadillac. 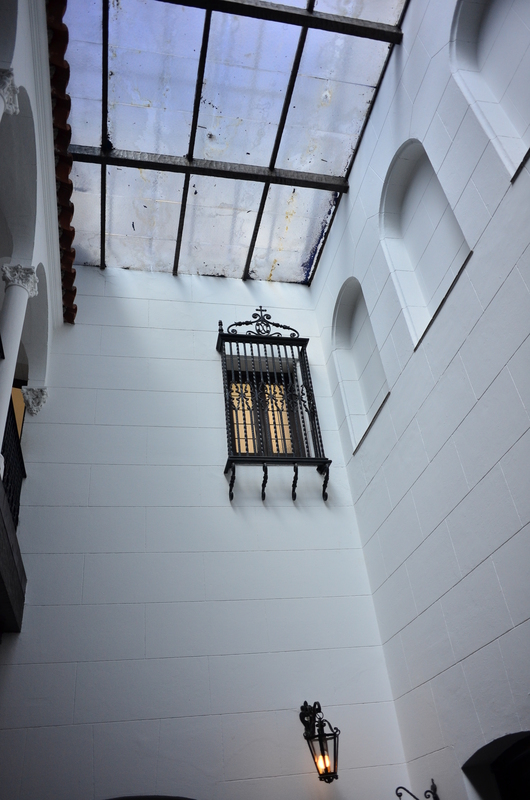 The Museo de la Moda often rotates their collection. They have a room with a video on repeat showing how they preserve the delicate textiles and why they do what they do. As a museum studies nerd, it was incredibly interesting to see how committed they are to ensuring that not only can people view their collection, but also that it’s taken care of to the best of their abilities. After taking lots of photos, talking lots about Mad Men and fashion history, and enjoying the beautiful outdoor patio, we ended our visit at the cozy museum cafe. I ended up purchasing the two museum catalogs for sale–a great way to see a lot of the collection without it even being on display. All in all, I highly recommend a visit to Museo de la Moda. 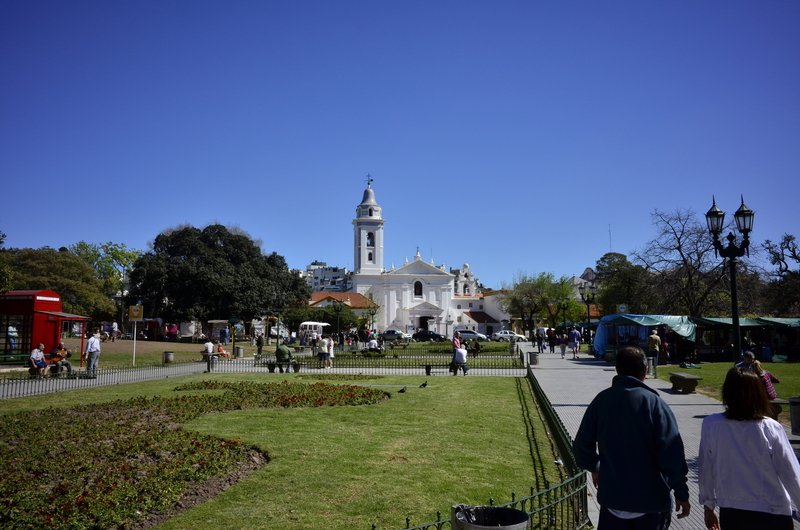 The Vitacura neighborhood was beautiful, and we took a long walk from there to a HUGE mall (we are pretty sure it was Alto Los Condes) in the Los Condes neighborhood. This was the swankiest mall we’d ever seen in South America–or possibly in North America, for that matter! Filled with three floors of the same stores you’d see at Pentagon City or King of Prussia, it almost felt like we were back in the US for a while! We ended our day with a movie at the mall’s Hoyts Cine. I was convinced that T would love “The Martian,” and it did not disappoint. We saw it in IMAX 4D, which was an interesting experience. Not only was the film in IMAX, but the seats moved and there were blasts of hot and cold air and spritzes of water. Although it was an interesting experience, we found the air blowers in particular to take away from the overall experience due to their noise at start up and cool down. 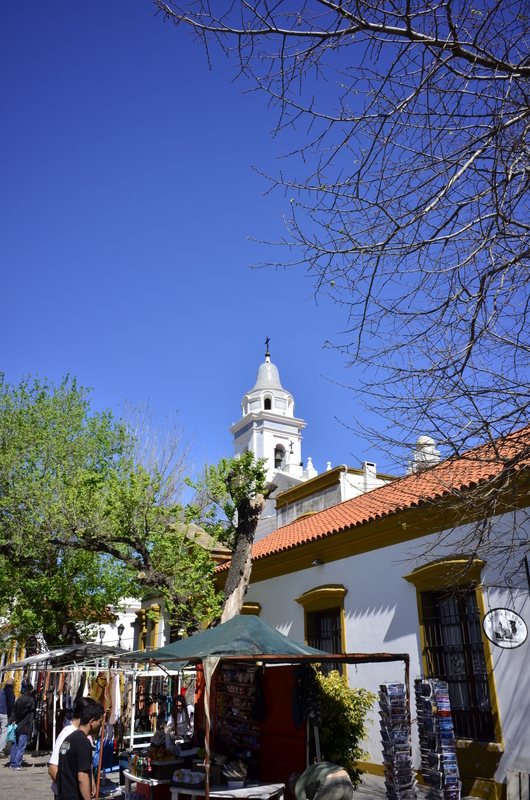 Museo de la Moda is in the Vitacura neighborhood of Santiago. It seems to close in between exhibitions, so make sure to check if it’s open before you venture. If you find yourself long-term in South America and find yourself missing high-end, American-style shopping, we couldn’t help but recommend the malls in Los Condes. Great for wandering on a blistering hot or rainy day and the movie theater was spectacular. 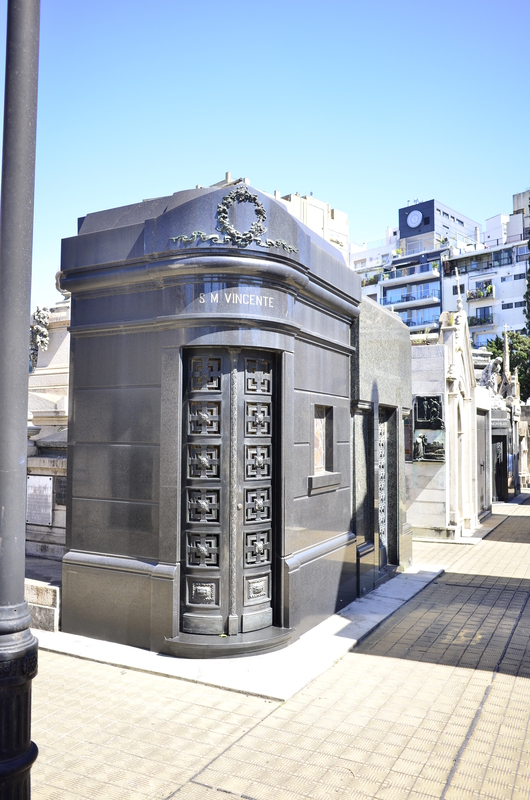 Now that we’ve talked about Eva Peron… let’s talk about where she is buried. 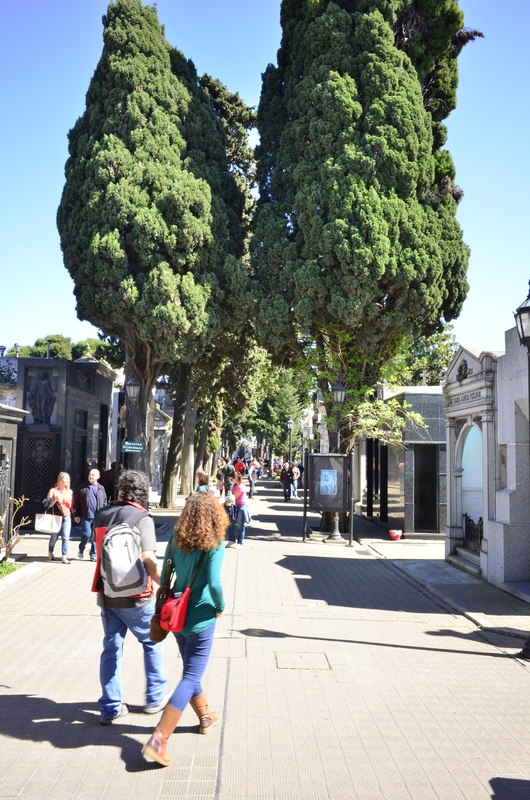 T was a little wary when I enthusiastically told him I wanted to visit a cemetery in Buenos Aires. 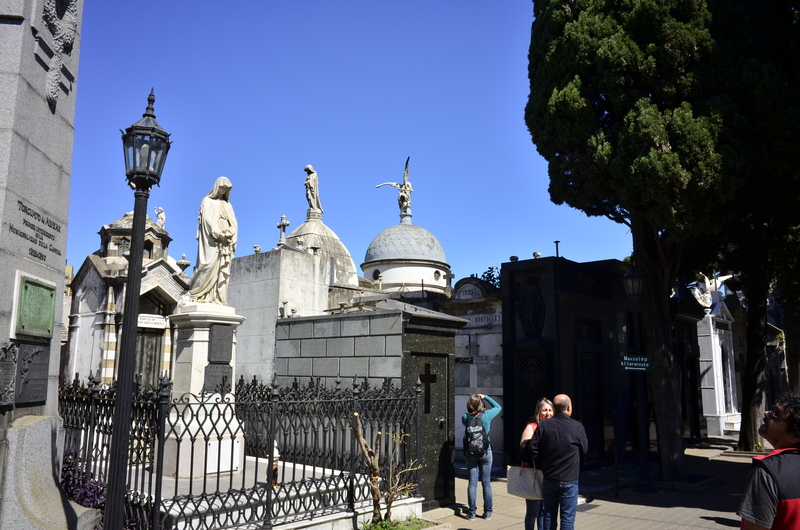 When we visited Cementerio de la Recoleta … he immediately understood why we were there. 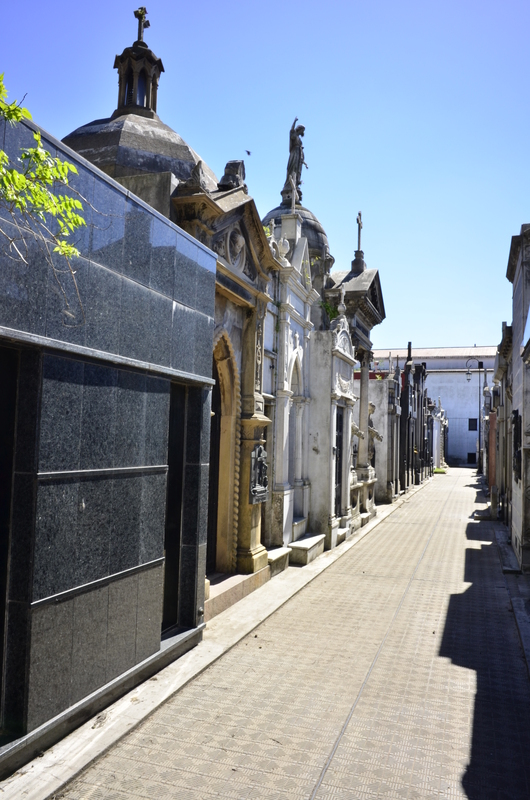 Unlike anything else I have seen before, Recoleta is a city of the dead. 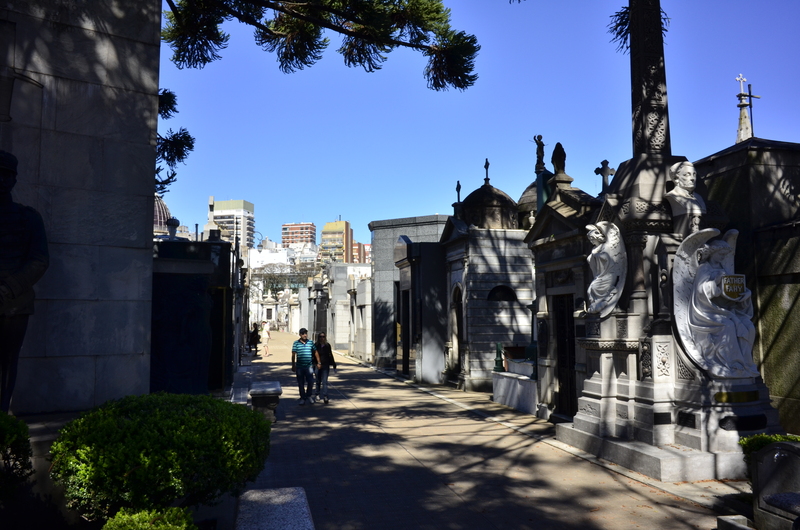 It is filled with elaborate mausoleums for the rich and powerful of Buenos Aires. What stood out the most for me was how different each tomb looked… and how some looked almost modern and were clearly well-kept by the family, while others were falling into disrepair. We wandered the rows for a while, marveling at the workmanship (and occasionally getting skeeved out by older caskets that seemed to warp the wood to almost opening). It’s easy to spend a few hours just wandering around and wondering what every person’s story was. My favorites were the ones that included photos and effects from those who were buried there–the family tried to tell a story of who these people were and what made them special. 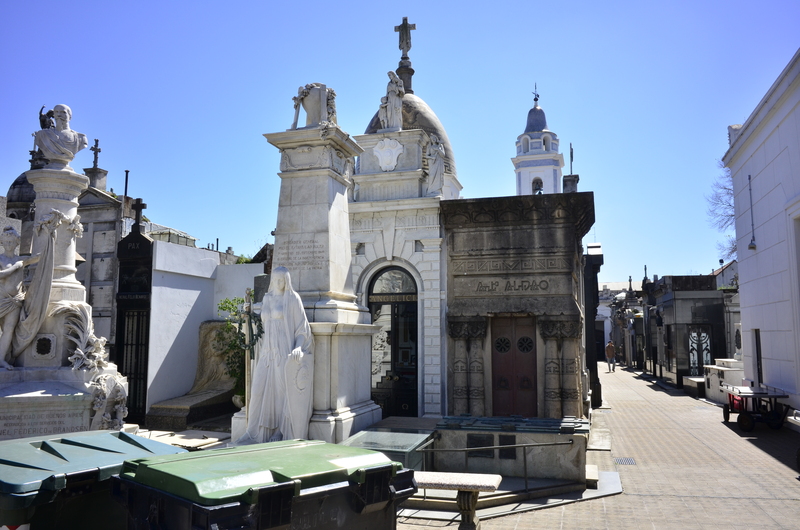 Some of the most important people in Argentinian history are buried there–including many of their “founding fathers” and pretty much every Argentinian president. 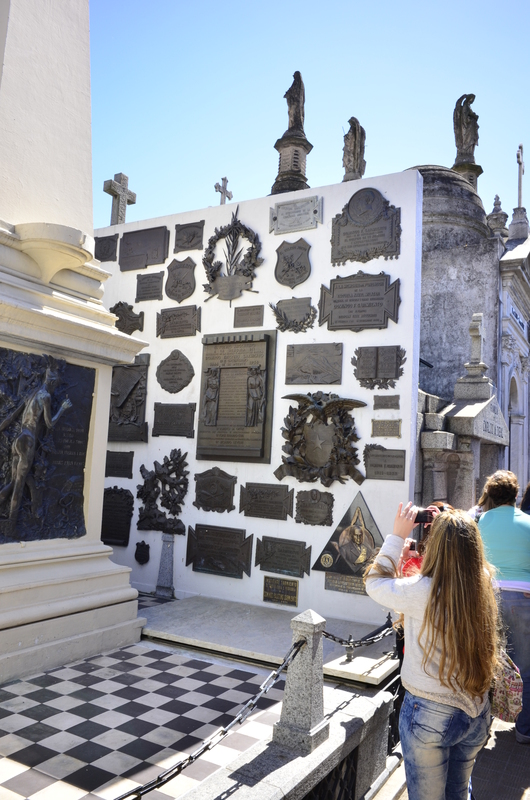 My Argentinian history is fairly rusty, so I wasn’t always quite sure what I was looking at. We did see the tomb of the La Paz family, which still owns the media conglomerate of Argentina, as well as Carlos Saavedra Lamas, who was the first Latin American Nobel Peace Prize recipient for his diplomatic work in ending the Chaco War between Paraguay and Bolivia (he also did a lot of legal work in establishing rights for workers in Argentina). 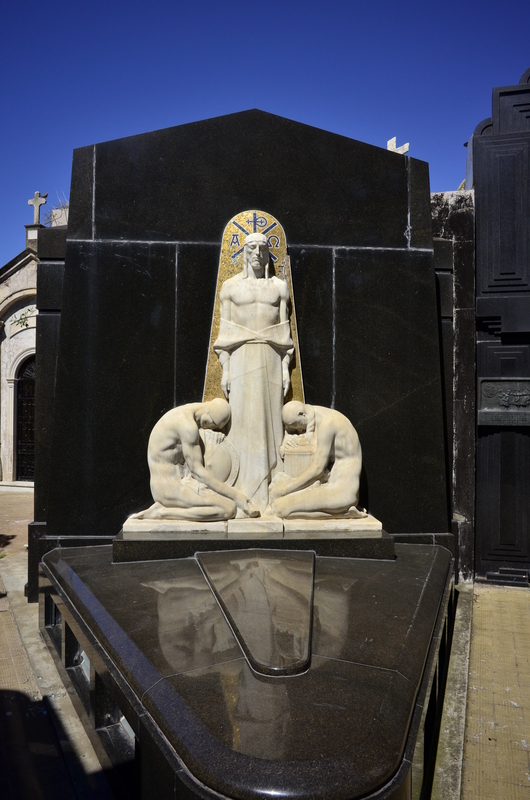 However, by far the most popular tomb is that of Evita. 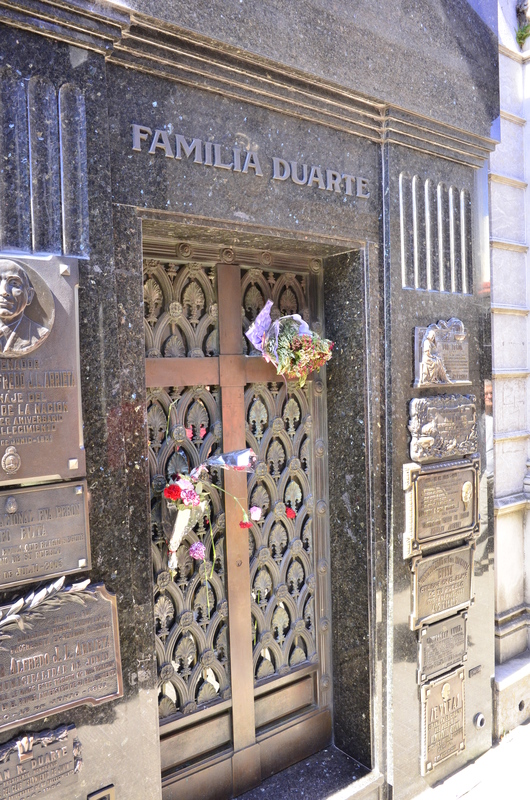 She’s buried in the Duarte family tomb. (Remember how she was illegitimate? One of her legacies was making sure that illegitimate children would be referred to as natural children, in order to give them some legal standing.) 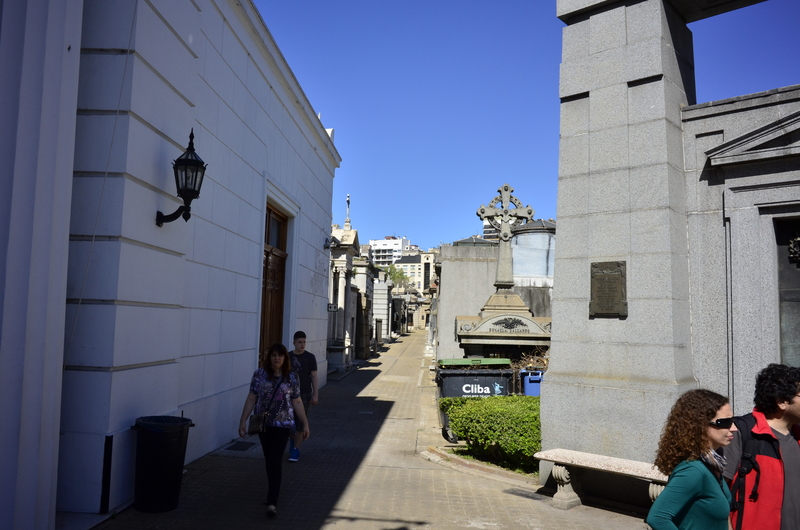 It’s not the fanciest tomb in Recoleta, and it’s somewhat hard to find (we trailed a tour guide speaking in English until we found it). But it perpetually has flowers outside of it. Here’s where I get to tell you the tale of Eva’s body. She died in 1952, and Dr. Pedro Ara was tasked with embalming the corpse and making her as lifelike as possible. 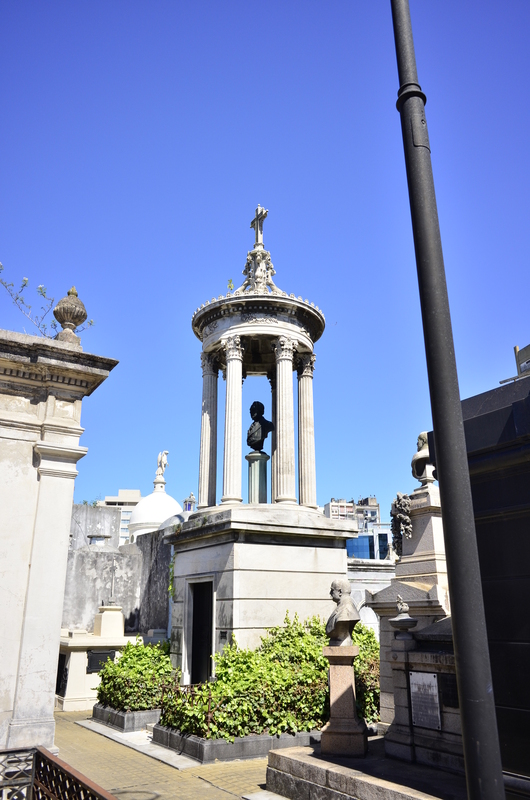 The ultimate goal was to create a statue of a descamisada (literally, “shirtless one,” but the word used by Eva Peron to describe the poor in Argentina) with a tomb for Eva’s body in the base. She was to be in a crystal casket and be on display (like Lenin). 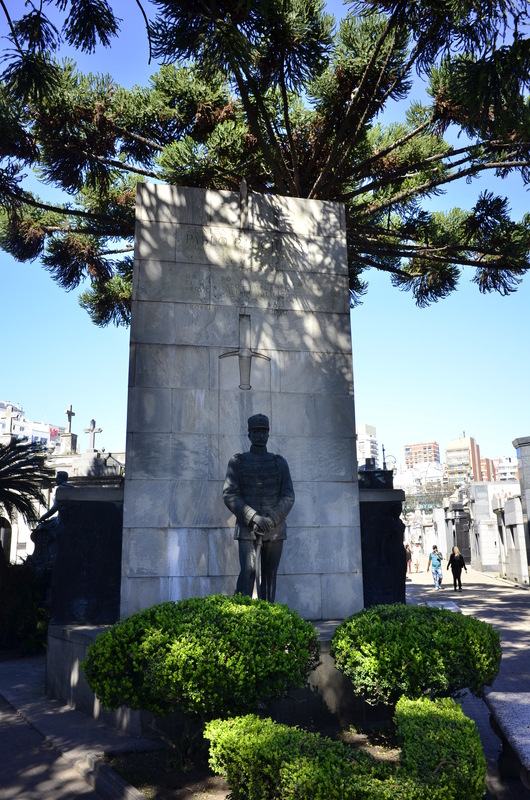 However, before the memorial could be creating, in 1955 the military overthrew Juan Peron and dictated a ban on Peronism until 1971. You could be punished for owning a photo of the Perons, or even speaking their names. In those years, Evita’s body went missing. According to this BBC story, her body was probably in a van, behind a cinema screen, in the Buenos Aires waterworks, and was ultimately removed to Juan Peron and his third wife Isabel in Spain. They set about restoring Eva’s body, which had experienced some deterioration and mysterious wounds. In a very weird twist, they stored the body in their own home, on their dining room table. In 1973, Juan and Isabel Peron returned to Argentina where they were elected President and Vice President, respectively. 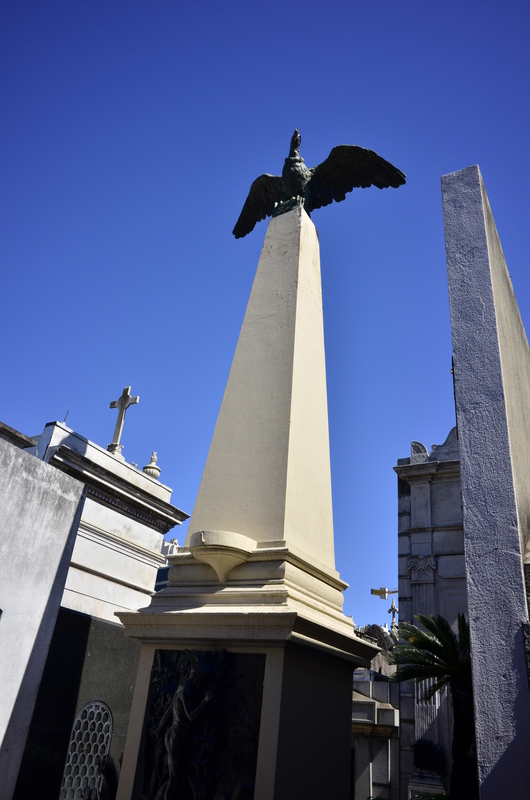 After Juan suddenly died, it was Isabel who ensured that Eva’s body was repatriated to Argentina for its final burial in Recoleta. Now, onto less grisly discussions… there was a beautiful outdoor market on the hill outside Recoleta that apparently runs every weekend. There you can buy all sorts of handmade crafts and goods–it was fun to walk around and see all of the ingenuity and creativity. We have plans to go back next time with a much larger suitcase to get some stuff as gifts and for ourselves! We clearly didn’t plan for all of the beautiful things we were going ot see in the market, and we only brought a small suitcase and two overnight bags total–so we’ll have to go back soon! 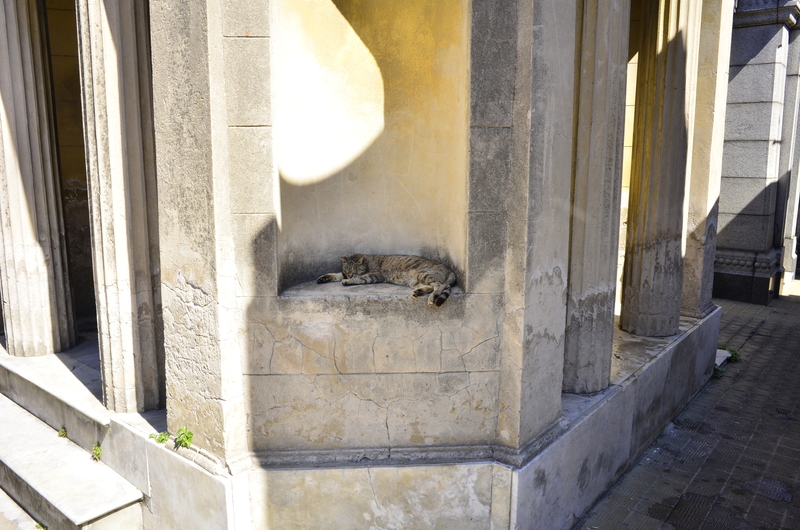 We did more than look at animals in Buenos Aires! We also decided to check out some of the museums that we’ve been hearing so much about. 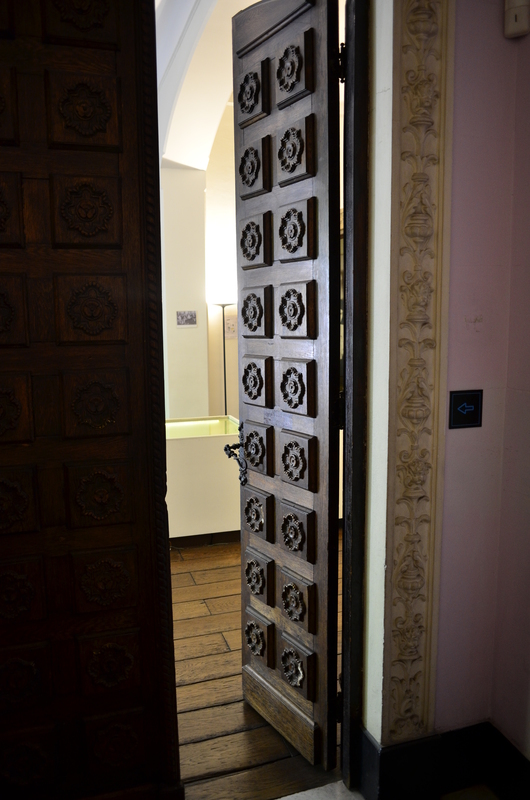 We had a disappointing moment at Museo de los Artes Decorativos (Decorative Art Museum) as only the first floor was open, and that floor was filled with a temporary exhibition of Italian paintings. The paintings were nice, but I wanted to see luxurious housewares! A bit of a disappointment, and I think we only spent about 30 minutes there. 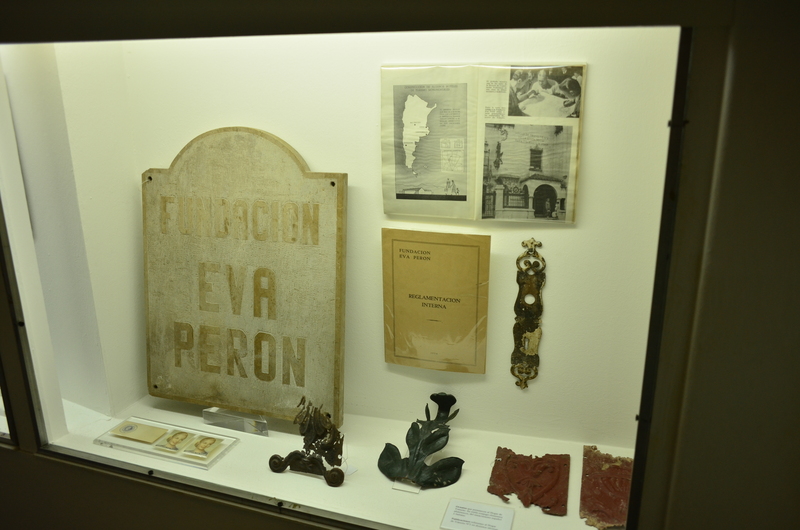 Instead, we decided to hoof it over to Museo Evita, the museum all about Eva Peron, who is still referred to on Wikipedia as the Eternal Spiritual Leader of the Nation of Argentina. For those of you who missed the movie starring Madonna, Eva Peron was born in the rural pampas of Argentina, became an actress and moved to Buenos Aires, and married Col. Juan Peron, who became president in 1946. She was the first woman to appear with her husband on the campaign trail, and she was a tireless crusader for women’s suffrage. 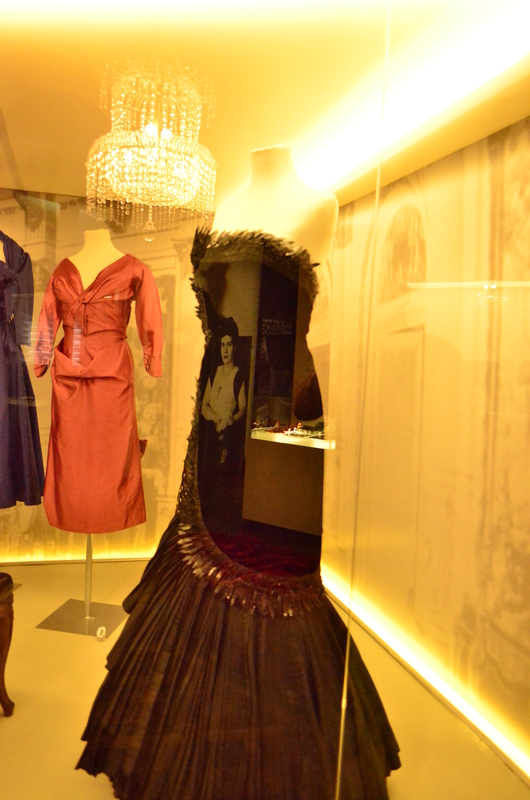 She was a stylish lady, with many of the exhibitions including her outfits. She embarked on a “Rainbow Tour” of Europe in 1947, meeting many dignitaries and heads of state, wearing an extravagant wardrobe. She was well received in Franco’s Spain, and had mixed reviews in the rest of Europe. I loved the black evening gown on display with feather trim. It would not have looked out of place in a red carpet lineup today. 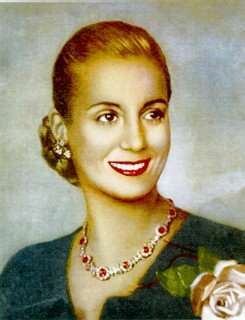 She was very philanthropic, and created her own Eva Peron foundation to focus her efforts on women, children, and the elderly. Through it, she established halfway houses (such as the one the museum is housed in), payments for single mothers, and a nursing school. 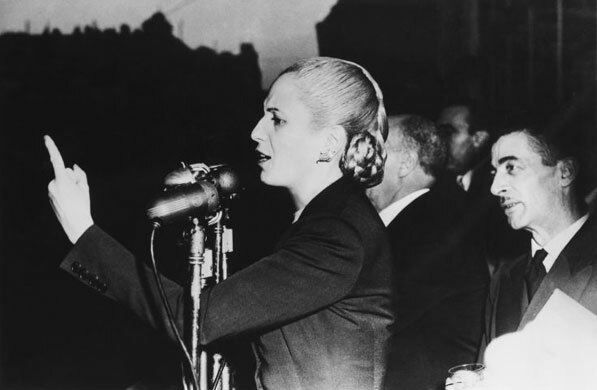 By 1951, Evita’s popularity had reached such a fevered pitch that the population called on her to run for Vice President–something that was frowned upon by the military. The Cabildo Abierto was a giant rally in Buenos Aires held where the approximately two million Argentines attended to support the Peron ticket. However, ultimately, she decided to not pursue the Vice Presidency–which furthered her image as a selfless saint and upheld the strong belief in marianismo (another post for another day–where I’ll actually get to use some of the Spanish degree I earned!). By 1950, she had been diagnosed with cervical cancer, and she underwent a radical hysterectomy in an attempt to stop the spread of the cancer and was the first Argentine to try chemotherapy. By 1952, she was in a parade with her husband where she had to be supported to standing with a frame of plaster and wire. She ultimately succumbed to the disease on July 26, 2952. 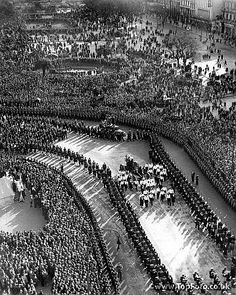 All official government activities were suspended for two days, and her funeral was attended by over three million people. She was 33. 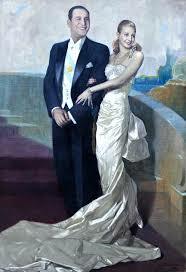 Evita is a a contentious figure, particularly in Argentina. Her father was a wealthy rancher with multiple families–of which Eva’s was not the main one, so thus she wasn’t a “legitimate” child. She didn’t have much of a formal education, and was an actress–putting her on the outs with the traditional Argentine high society. Her Rainbow Tour of Europe was criticized as having been an expensive cover for her depositing vast amounts of Argentine money for the Peron’s personal use in a Swiss bank account. She gained more expensive tastes in clothing after her European tour, preferring skirt suits made by Dior and jewels by Cartier. Some have said that even her foundation was just a means to funnel money to the Peron’s personal bank accounts. Even in her death, critics said that the outpouring of grief by the average Argentine was less of a real feeling of grief, and more of a reflection of how well the Peronist “passion plays” were distributed to the public. One thing that is true beyond a shadow of a doubt is that Evita forged some of her documents. She forged a birth certificate that listed her as the child of two legitimate parents, and also changed her birth year to make her three years younger. She was possibly a fascist, and indeed the time when her husband was in power (either in the military or as president) was the time when Nazis were escaping to Argentina–although there has been some discussion that she was less fascist and more the victim of her husband’s influence and went along with his views. I was surprised that the museum did address some of these criticism, despite its benefactors–it was created by her niece and is funded by her foundation. Although it didn’t reflect all of the criticisms, it did address her illegitimacy, and her “other-ness” within established Argentinian society. The museum noted that she could be incredibly brash and brusque, and that tended to put her at odds with others in power, particularly in the military. It didn’t address the later issues of Juan Peron (google “Dirty War” for a primer on that), but focused only on Evita’s experience. Evita’s legacy is an interesting one, and one that is wholly Argentinian. She combined radical leadership, spirituality, and femininity into a package that stirred the people to act. It was revolutionary that a woman held the power that she did in the very macho Argentinian society. She is featured on the Argentinian peso, and regardless of the political party, she is still considered an important part of Argentine history. In some portions of Argentine society, she is even considered a saint! The museum itself was built in 2002, and is well-presented. 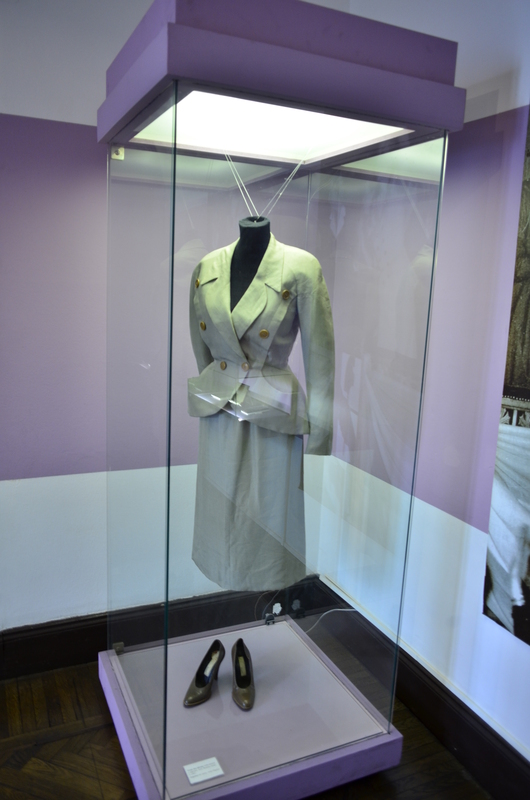 There are videos of her speeches and appearances, and plenty of her stylish outfits on display, as well as some items that are related to either her or her works. 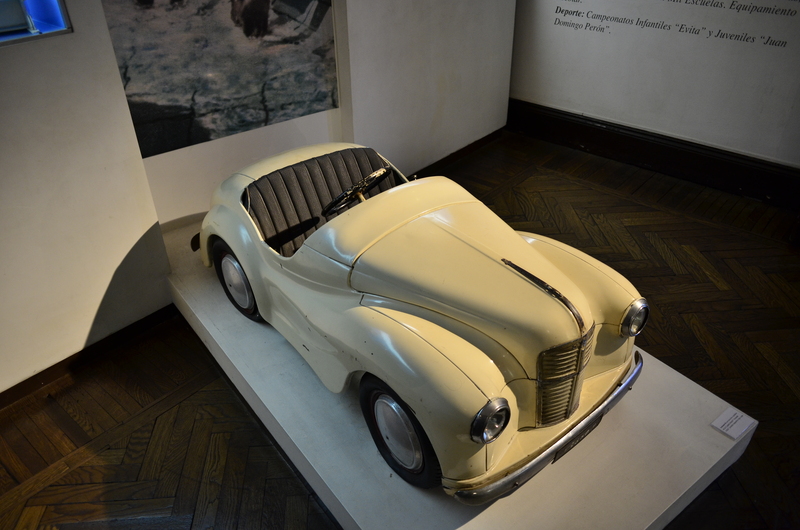 I enjoyed how the museum told the story of the building’s role as a halfway house founded by Evita’s foundation. It only took about 2 hours to go through the entire museum, and I read everything. If you go, look on the wall near the doors for the plaques with the English translation of (most of) the written descriptions in the room. 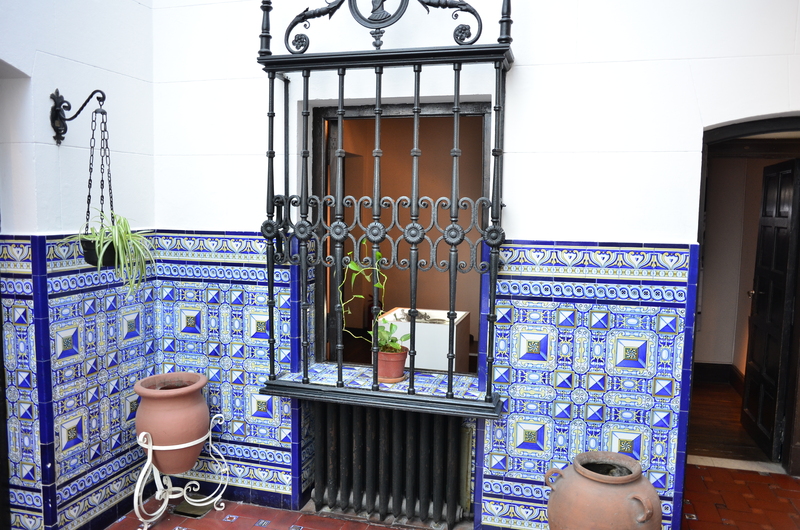 Also, the restaurant attached to Museo Evita is excellent–it had a long line for the sunny patio seats that were pet-friendly, but we were too hungry to wait and took a table inside by a large window and got some vitamin D from in there. The menu was modern, tasteful, and full of variety. I enjoyed my chicken and vegetable ravioli, and T enjoyed his gnocchi, but we absolutely loved the bread best–warm, freshly baked, and filled with fresh herbs. The dipping sauce that came with it was very Argentinian–mayonnaise with sun-dried tomatoes and red pepper, which is not odd to the average mayo-obsessed Argentinian, but definitely was not what we were expecting! I would be remiss if I didn’t remind everyone about one of my favorite things: Museum Day! One day a year, 1,500 US museums open up their doors for free! All you have to do is go to the Museum Day website, and you’ll get a free ticket good for two people mailed to you. It’s an excellent deal to check out the museums in your hometown you just haven’t gotten to yet. This year’s is September 27th. 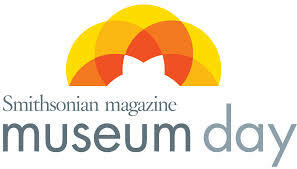 As an additional bonus, anyone who registers to get the tickets gets a free one year digital subscription to Smithsonian Magazine–one of my favorites. National Canal Museum (Easton, PA)–and visit the Crayola Factory while you’re in the same building! College Park Aviation Museum (College Park, MD)–Great for kids! I’m only recommending the museums I’ve been to in these areas–out of the list, I know there are even more awesome discoveries. Also, if you’re interested… SavvySugar has a great resource on free admission to museums, cultural centers, aquariums, and zoos. I’m going to go off on a tangent today. Those who know me well, know I am an unashamed history geek. I participated in National History Day for years in middle and high school, and have served as a regional judge in my adulthood. 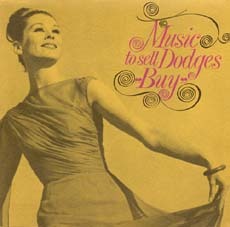 If I still had the opportunity to do a History Day project, I know exactly what I would focus on: industrial musicals. 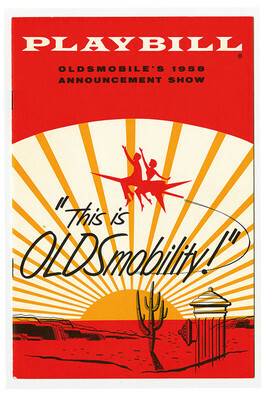 An off-shoot of the musical frenzy of the 1950s, 1960s, and 1970s, these were musicals written and performed for specific companies and industries. More than just simple jingles for a commercial, these were fully staged productions with high caliber writers and performers. 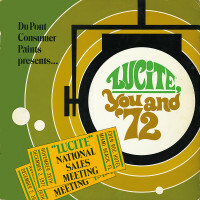 After the rousing performance, you were either given or cold purchase a record of the catchy songs you had just heard at the national sales meeting. It was supposed to pump up the sales force to go out and sell more and more of the product–and boost morale (and ostensibly productivity) in the employees in general. They’re an oft-forgotten facet of the corporate career experience of the post-WWII era. 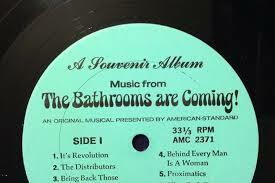 In another related note, IBM apparently had a full songbook for its employees. Compared to today’s sober work environments, it’s amazing to think about how much time and energy were placed into these musicals that the public would never see. 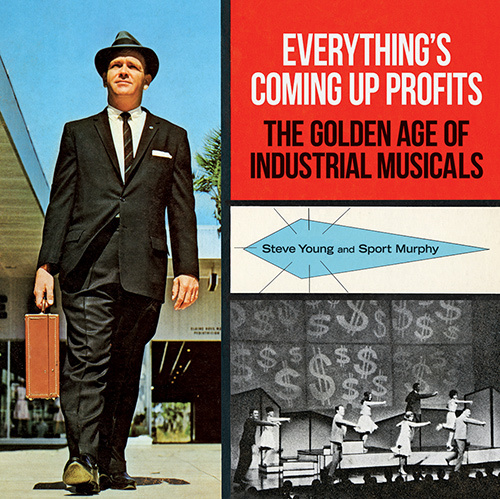 Check out Young and Murphy’s official website to hear more songs from industrial musicals. Bonus to those back in our home of York, PA–York Air Conditioners (now Johnson Controls) was big into these musicals. Check out the link above to hear a song or two!